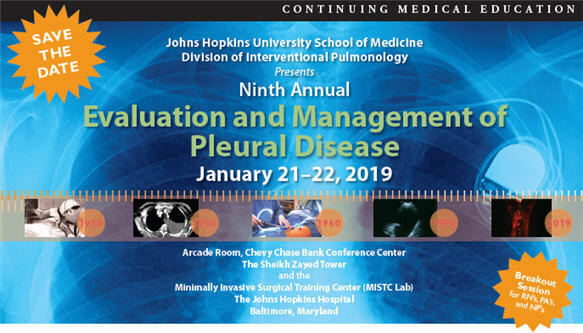 This activity is designed to educate the practicing pulmonologist and chest surgeon, as well as other health care professionals, interested in the care of patients with pleural disease. Participants will develop a comprehensive knowledge of the indications, contraindications and associated complications of common pleural procedures including thoracentesis, chest tube and indwelling pleural catheter placement, pleural biopsy and thoracoscopy. Procedures will be discussed in the didactic session on day one and will be demonstrated and practiced on day two at the hands-on stations on human cadavers in the MISTC Lab. Use ultrasound to guide pleural intervention. Discuss in detail the evaluation and management of patients with pleural effusion and pneumothorax. The Johns Hopkins University School of Medicine designates this live activity for a maximum of 12 AMA PRA Category 1 Credits™. Physicians should claim only the credit commensurate with the extent of their participation in the activity. Successful completion of this CME activity, which includes participation in the evaluation component, enables the participant to earn up to 12 MOC points in the American Board of Internal Medicine's (ABIM) Maintenance of Certification (MOC) program. Participants will earn MOC points equivalent to the amount of CME credits claimed for the activity. It is the CME activity provider's responsibility to submit participant completion information to ACCME for the purpose of granting ABIM MOC credit. PAs may claim a maximum of 12 Category 1 credits for completing this activity. NCCPA accepts AMA PRA Category 1 Credit™ from organizations accredited by ACCME or a recognized state medical society. The Evaluation of Pleural Effusions: Does Light’s Criteria Still Apply?